A fabulous Home in Rome! Just look at the pictures and you'll agree, this is a very special property! 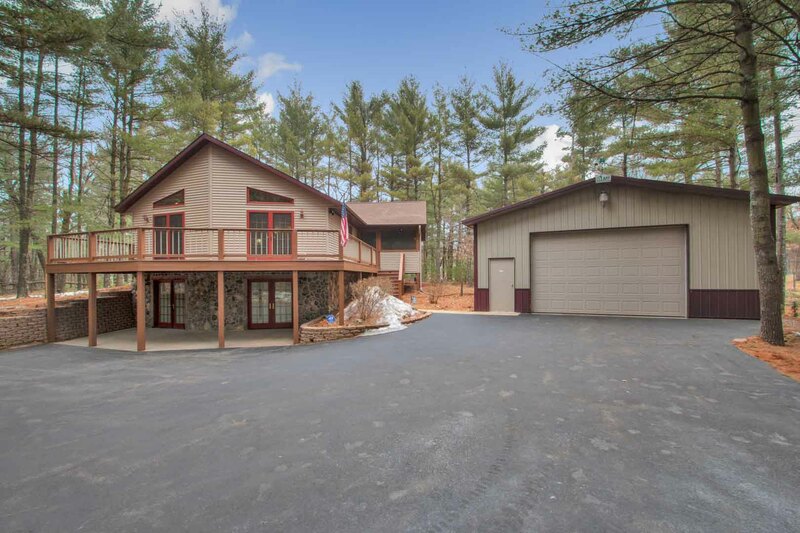 Near Lake Petenwell, surrounded by majestic old growth white pines, designed for easy livin' with an abundance of creature comforts, and complete with a 30x50 outbuilding (with a shop of course) to house all of those fun-thrilled machines (the kind that burn non-ethanol, high octane gas!) that enhance the Rome outdoor experience. It's perfect! With two finished levels, 4 bedrooms, 3 baths, a one of a kind screen porch, spacious deck, and patio, you'll have plenty of room for family, friends, and even the in-laws. Features include an open great room design with cathedral ceiling finished in rustic knotty pine, maple flooring (throughout main level), gas fireplace, and swinging patio doors; beautiful kitchen endowed with custom maple cabinetry, island, breakfast bar, pantry, under-cabinet lighting, and large adjacent dining area; exceptional master suite with 2-person Jacuzzi, separate shower, and double vanities; finished lower level with expansive family room, game room, full bath, 4th bedroom, and under-floor radiant heat throughout. Other notables include panel doors, warm interior colors, main-level laundry, security system w/ cameras, stone/vinyl exterior, asphalt drive, the mother of all fire pits awesome! ), perennial gardens, and, in case you overlooked it, a 30x50 outbuilding! There's so much more here, but you'll need to just take a look. MOST major interior furnishings are included. A quality, neat as a pin home that you will be very proud to own! In Rome ... Great Lakes, Great Golf, and the always Great Outdoors! Fireplace: Stone, Gas in Living. 40,000 BTU! Garage: 30x50 Pole Building w/ Concrete floor & Shop! Porch: 14x20 Screen Porch. Pretty Awesome! Fabulous Brick Fire Pit (24' Diameter!). Perennial Gardens.